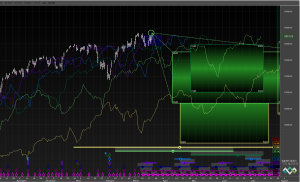 This entry was posted in Analysis US Markets on March 24, 2014 by SilentOne. 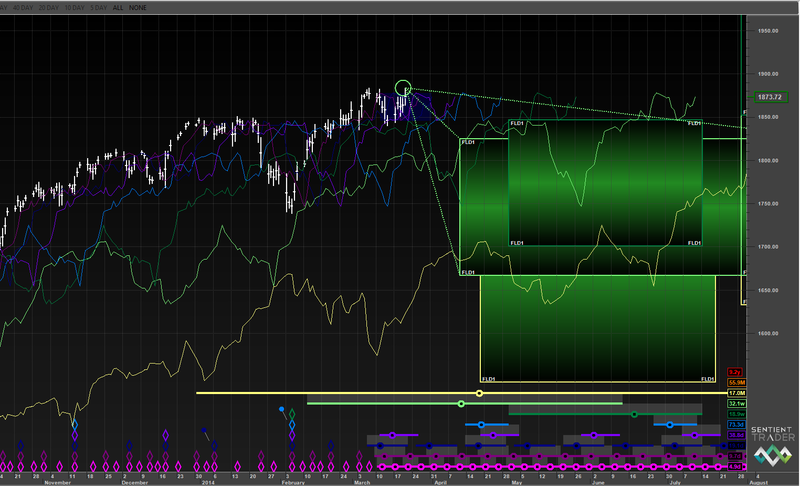 In January I suggested that we had seen a contracted 4.5 Hurst cycle in Nov. 2012 for the US markets (eg. $SPX) and that based on price action seen in the 70s and 80s, we should look for a straddle trough to form for the current 18 month cycle. I will defer first to the NYSE Summation Index ($NYSI) to show where 40 week Hurst cycles likely occurred since the 2011 bottom. 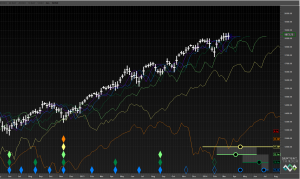 Hurst 40 week cycle lows occurred Oct. 2011, June 2012, Nov. 2012 and most likely late August 2013. 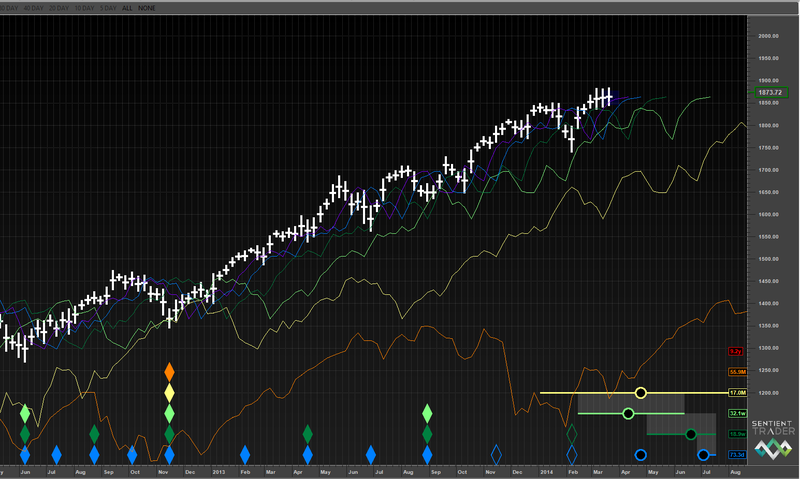 This suggests that cycles started to expand in the first 18 month cycle off the Nov. 2012 low. My preferred phasing is then as follows where Nov. 2012 is a contracted 4.5 year Hurst cycle trough and late August 2013 was a 40 week Hurst low. I suggested in Jan. that we would see a Hurst 20 week low and I believe that cycle is now at its peak. We should decline from here into an 18 month Hurst cycle low. This decline will probably not be your garden variety correction in a bull market. 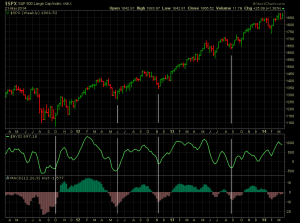 With contracted cycles as we’ve seen, markets tend to get far ahead of themselves. The examples I showed in January’s post suggest that the $SPX could retrace almost all of last year’s trading into the coming 18 month trough. Having a look at the daily cycles, we likely saw a 5 week low on March 14th and as this 10 week cycle rolls over, we should learn how strong the coming decline is likely to be. The next 10 week Hurst low is due by mid-April and I expect price to break below the level seen at the 20 week low of Feb. 5th. If this type of cycle failure occurs, we are likely to see a very large monthly down bar in April as this correction progresses. The bigger question is what to expect from the coming 18 month low? If a severe correction does occur here in the next few weeks, we will likely see a bear market take hold into the 9 year Hurst cycle low. And here’s an interesting fact. Did you know that the $SPX rally in the last five years was greater (point wise) than that from 1994 to 2000? I’m going to add a comment since no one has much to say. The $SPX cycles appear to be very flat right now. We likely saw a 5 week cycle low on March 14th. We are due a 2.5 week low next week and a 10 week later in April. A top to this 2.5 week cycle is due soon, however because the cycles appear to be very flat, a retest of the highs looks imminent. A 3-4 day low is due Thursday and from that low I would expect one final ramp up and month end type price action. From there we should learn what the market really wants to do. GLGT. Interesting analysis. I use bandpass filters to extract the price waves which provide a good look at the amplitude of the waves. I agree with your observation that the amplitude of the longer waves has dissipated greatly, particularly the 80 week wave. The 10 week (56 day) wave is still very visually evident though. BTW is it possible to post charts in the comment box? I would like to post an example of the bandpass filter output. Long time no see. Glad to see you have kept up the Hurst analysis since back in the day of Airedale in 2005. I am looking for a 10/20 week low in the next couple of weeks and the strength at the end of last week surprised me a bit with SPX closing at ATHs above 1900. Wonder what your thoughts are about the latest phasing and might the Feb low have been an 80wk low with June 2013 the 40wk low off the Nov 2012 80 wk low? 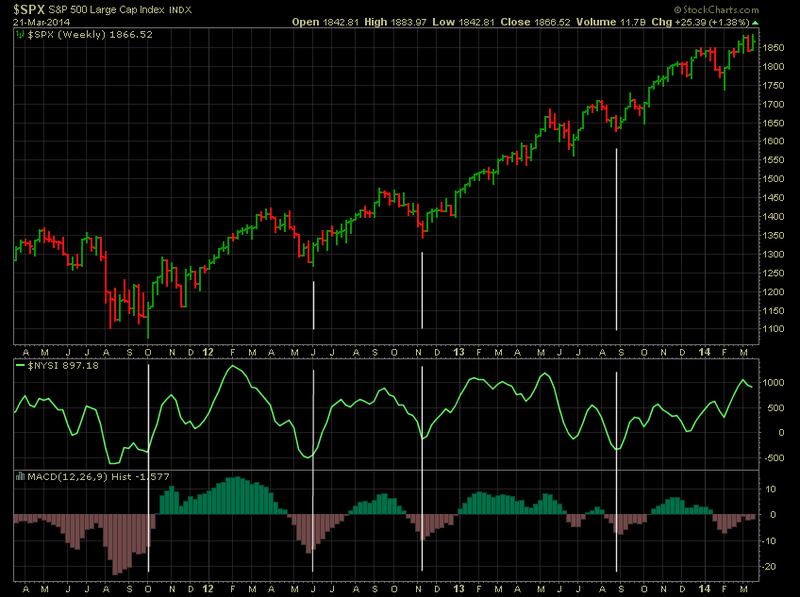 The nominal 20 wk cycles have been running about 16 wks for quite awhile now it seems. I have obviously misread the significance of the early Feb. low and no doubt it was an 80 week low. My original take was that we were going to see an 80 week low form here and that is not going to occur. So betting on a significant decline here is pure speculation from a Hurst point of view until something changes. I’ll try to update my thoughts but I am in the middle of yet another house project. Hope you are well. Am well. Thank you. Since the advent of QE and ZIRP and coordinated CB actions, we have to always be on the lookout for further shortening of cycle lengths I am afraid. GL on your home project and look forward to hearing more about your thoughts.